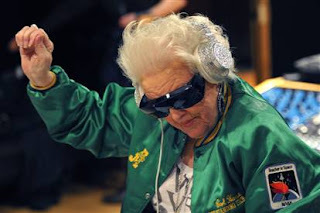 Granny DJ rocks the clubs in Paris – ¿¡ tjongolongo ?! British DJ Ruth Flowers is a 69 year-old grandmother that is currently spinning her tunes in Paris nightclubs. She first came across the club scene after going to her grandson’s birthday party. She said: “I went along quite late and the gentlemen at the door said, ‘I don’t think you want to go in there, Madame’. And I said, ‘Well I rather think I do’,” she said. That night she became so enthusiastic she decided to start DJ-ing herself. A friend put her in touch with French producer Aurelien Simon. He taught here all about how to DJ and has helped her develop her own style. It took her four years, but she learned it and is now busy DJ-ing in French clubs. She not only DJs as a proper DJ, she also looks the part with her satin green bomber jacket and huge shades. A great sample of good communications, not only is she influencing people by talking about her DJ-ing, she also looks the part! Tjongolongo, I thought it was cool when I was dancing with my 85 year-old grandma, mom, aunt and cousins to I gotta feeling from the Black Eyed Peas (trying to do the Oprah flashmob choreography). This definitely tops it though. Tjongolongo, this granny is cool, I hope she keeps spinning for many years to come! Does your granny spin at nightclubs? Nacho cheese flavoured lip balm anyone?